I wanted to create a vegetarian version of this classic. This soup manages to be warm and fresh all at once. Perfect for this transitional time between seasons when its starting to get a bit cooler outside, but there is still an abundance of summer vegetables at the market. Because its a vegetarian soup, I added a lot of spices. Don’t skimp on the spices. Add them in the beginning, with the onions and garlic to release the most flavor. 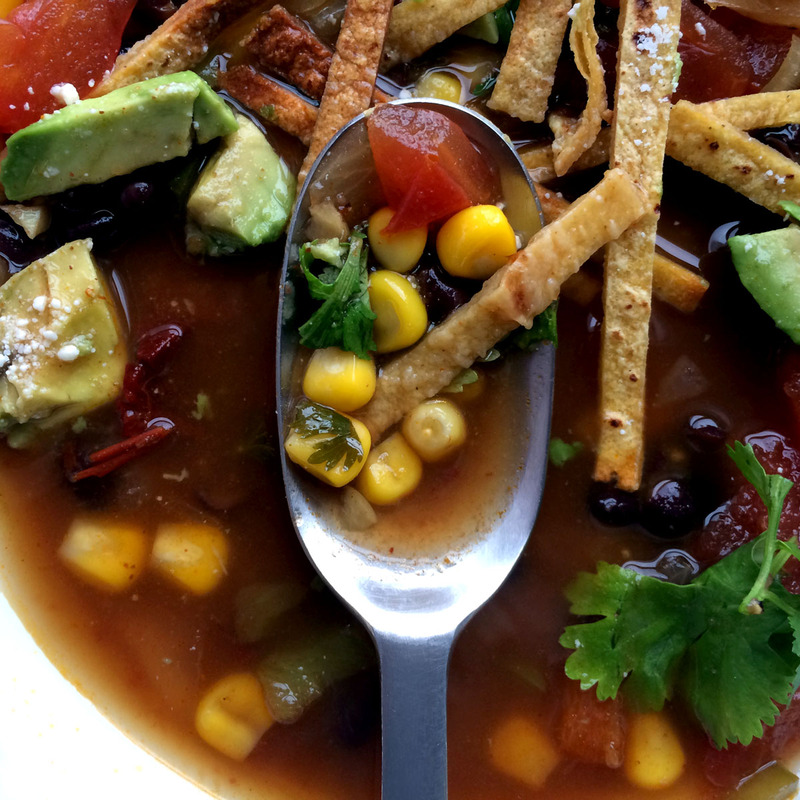 The dried ancho chile adds depth and that signature smoky flavor in tortilla soup. Also, toppings are super important here. At the very least you MUST have avocado and tortillas. The chopped cilantro and lime add a bit of freshness and the cheese is totally optional. Heat olive oil in large pot over medium heat. Add garlic and onions and sauté for 2 minutes. Add chopped green and red peppers, sauté for another 2-3 minutes and add spices. Mix until combined, add chopped ancho chile, also adding any extra liquid that has collected in the chile from soaking. Add tomatoes and a bit of chopped cilantro and cook for another 5 minutes. Add broth and bring to a boil. Reduce heat to simmer and cook until flavor has developed and vegetables have softened- about 45 mins-1 hour on a low simmer. Taste and add/adjust spices. Add black beans and frozen corn and cook for another 10-15 mins. Meanwhile prepare your toppings. Slice tortillas into strips and place on baking sheet. Heat broiler to high, broil tortilla strips until crispy about 5-10 mins. Remove from broiler and set aside. Slice avocado. Chop cilantro. 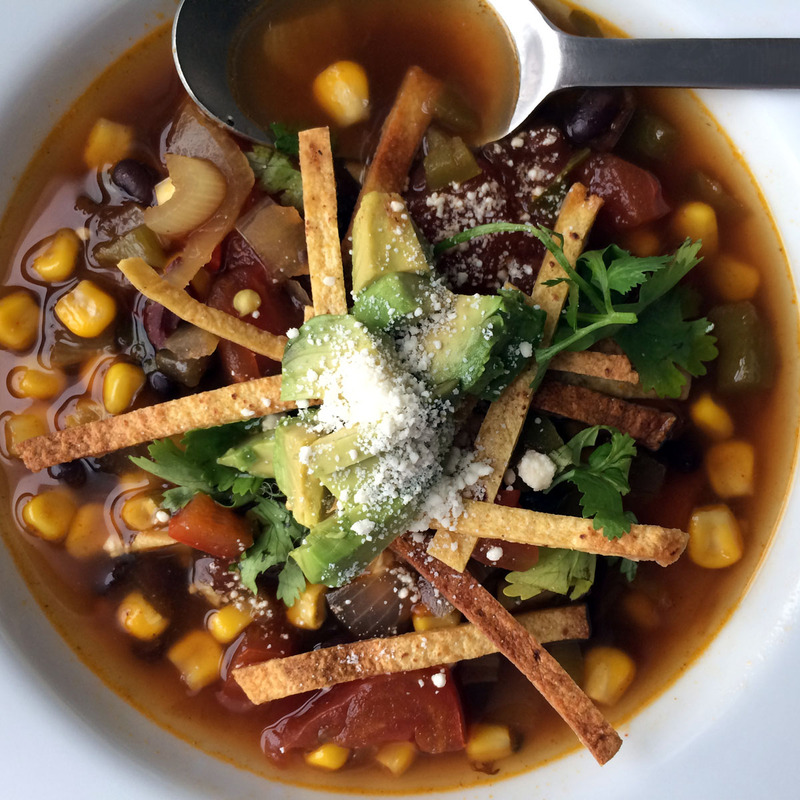 Spoon soup into bowls and top with the tortilla strips, avocado, cilantro and (optional cotija cheese.) Squeeze a lime over the soup and serve!